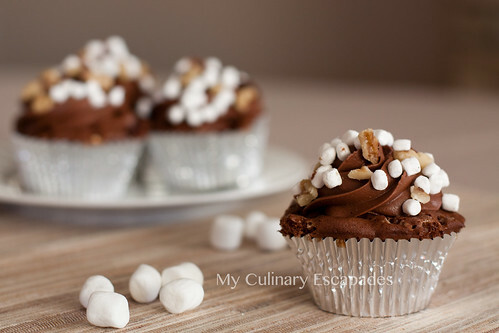 These cupcakes which are filled with marshmallow bits, walnuts and chocolate chips are dangerously decadent. 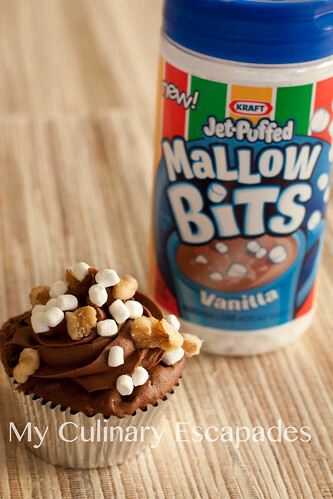 The creamy chocolate icing topped with bits of walnuts and Kraft Mallow Bits only add to the amazing cupcake. The best part is that the base of these cupcakes is a box mix. I simply mixed it according to the directions on the box and added some extra ingredients. The icing is made from scratch and topped with Kraft Mallow Bits and chopped walnuts. These Mallow Bits are kind of like the marshmallows from Lucky Charms and you are going to have to hide them in your pantry so your kids don’t eat the entire jar. Not only do they taste great they are super cute. Mix box cake according to the package directions. Add walnuts and chocolate chips and stir them in by hand. Once fully incorporated scoop batter into cupcake papers. Bake according to box instructions. Cool in pan 10 minutes. Then remove to a wire rack to fully cool. Cream butter and shortening together until fully incorporated. Add powdered sugar and cocoa powder and mix slowly. Add vanilla and milk 1 tbsp at a time until desired consistency is achieved. In a separate bowl mix the Mallow Bits and walnuts. Place frosting into piping bag with 2D tip. Pipe icing onto center of cupcake. This is my favorite tip for cupcakes! Holding the cupcake in one hand place some of the Mallow Bits and walnuts in your other hand. Lean the cupcake into the bits on your hand and press gently.